During the conference in Boston, NACAC's Assembly voted unanimously to approve the Statement of Principles of Good Practice: NACAC's Code of Ethics and Professional Practices. In the redesigned statement, NACAC members will find new policies, procedures, and professional practices. A webinar for International ACAC members is planned for early 2018. At our membership meeting, we announced the new Global Fund, which will go into effect in 2018. The Global Fund will serve to consolidate our programs that provide access to professional development opportunities for our under-resourced members, including the Scholar Program and Conference Travel Grants. An exciting new addition will be the launch of Global Grants, which aim to engage our membership and provided increased access to professional development opportunities on a local level. Similar to NACAC's Imagine Grants, members will be able to apply for an International ACAC Global Grant to provide funding for the implementation of new or innovative programs or professional development opportunities in their local area. Information on how members can apply for, and contribute to, the International ACAC Global Fund will be released early in 2018. 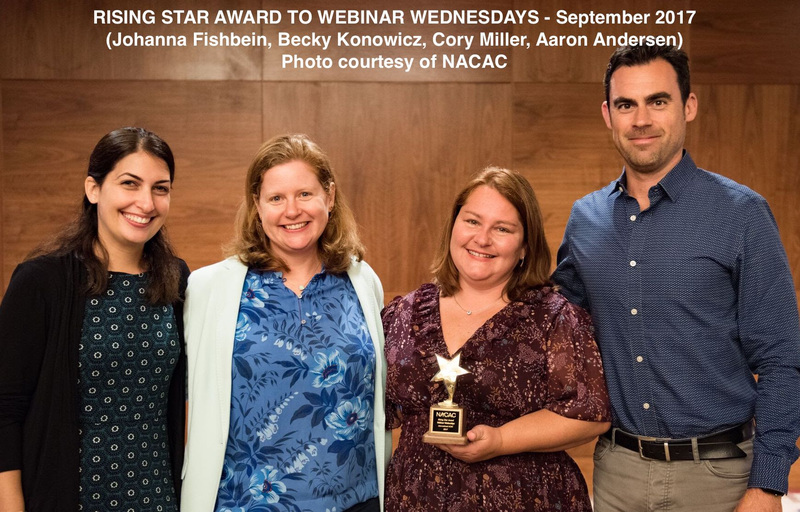 Our own Webinar Wednesdays was recognized with a NACAC Rising Star Award, an honor that acknowledges "programs that exemplify excellence and dedication to serving the needs of students in the transition from high school to college". Since its launch in 2015, the program has served 2,244 attendees from 67 different countries. *Attached below is a photo from the award ceremony. Western University in London, Ontario, Canada was announced as the host for the 2019 Conference. International ACAC kicked off its 25th year with a little help from our 2018 Conference hosts, Tulane University and Loyola University New Orleans. The festivities commenced when a local brass band led a 'Second Line" parade into the membership meeting, followed by a reception with birthday cake. Stay tuned for upcoming contests and opportunities to commemorate our 25th year!